BC Sport Fishing Guide. Freshwater Saltwater Sport Fishing Vacations in British Columbia. 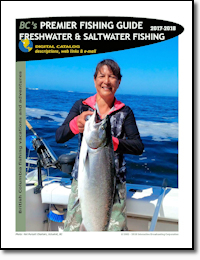 This free catalog and vacation guide showcases select freshwater and saltwater fishing resorts, lodges, camps & guides of British Columbia. Plan unique freshwater trout fishing vacations on BC's trophy lakes, rivers, and streams! There is also a wide selection of British Columbia's world class saltwater angling destinations for salmon, halibut and bottom fish. The British Columbia Premier Sport Fishing Guide is your free trip planning tool offering a selection of BC's Freshwater and Saltwater sport fishing resorts, lodges, camps, charters and professional guides. World class angling opportunities for rainbow trout, salmon, halibut and bottom fish, and unforgettable destinations. Download your free copy now.